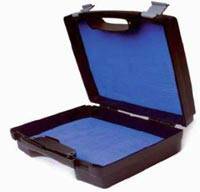 The NEW IP Rated Xtreme range of fly boxes has been specially developed with the Predator and Saltwater enthusiast in mind. 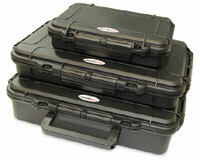 Dust proof and waterproof (up to 1m) these boxes are ideal for keeping your precious lures protected from the elements. 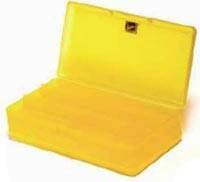 All sizes have a locking clip, rubber seal and are designed to be padlocked if required. Made in Italy. New and Exclusive to Fulling Mill for 2016 the Clear Silicone FM Box is a sure fire winner. Using silicone rather than foam, these boxes hold the flies tightly and securely whilst keeping them dry. The clear lid lets you see your collection with ease whilst both sizes will fit in your pocket. An exciting new alternative to the traditional drying patch, Tacky Fishings innovative new Tacky Tube keeps flies safe and enclosed while allowing plenty of air circulation. The Tacky Fly Box is a tough and sleek polycarbonate box with a clear top, a magnet closure system and a patent-pending silicone rubber insert. It is the insert that is attracting all the interest in that, unlike many of the boxes currently on the market, it has little memory and therefore holds flies securely over a much longer time frame. 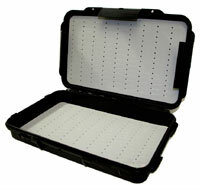 The Tacky Day Pack Fly Box is a smaller version of the standard Tacky Fly Box. The ultimate streamer box, but also great for Salmon and Saltwater flies.  Constructed from super strong ABS plastic with see through lid.  High quality pre-slotted foam.  Constructed from tough ABS plastic.  Completely clear for quick fly selection.  Sufficient depth to hold largest of mayflies without crushing hackles or wings.  Available in either 6 compartment (for larger dry flies) or 12 compartment (for smaller flies). 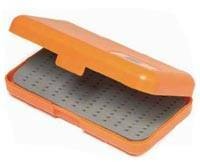  Compact foam inserts in lid and base ensure sufficient space for flies of up to 12 inches long.  Robust locking clips means box cannot inadvertently open.  Comes with easy grip handle.  Generous depth avoiding damage to hackles and hairwings on larger patterns.  Appropriate for bomber style dry flies.  Tube fly box has extra long compartments to house the largest of tubes (eg Monkeys) and smaller compartments to house regular hairwing patterns up to 3" long.  Tube fly box also has special compartments for double and treble hooks.  Made from polypropylene, making them unusually tough. 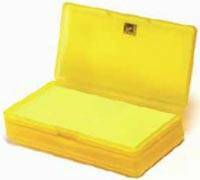  Available with either foam inserts or 6 compartments. A really handy box which can be used to store a multitude of fishing accessories.  Clear lid allows for quick fly identification.  Plastic, non rust hinge. One of our favourites, the Morell easy open/close fly box is near unbreakable, almost weightless, and perfect storage and protection for your flies. The multi layered density foam returns to its original shape even if you stand on it, and coloured boxes come with a satin soft nylon cover making them super smooth to the touch. And best of all, if you drop it in the water it will float so you don't lose your flies! Beware of the poor over weight imitations which will break if crushed. Make sure it's a Morell! 10cm x 7.5cm x 3cm. Perfect to hide away for emergencies. 21cm x 10cm x 5cm. The only box to take on a bone fishing expedition.